The Fiat 500 Abarth is back for 2014 with new colors, new wheels and a more comfortable passenger seat design. 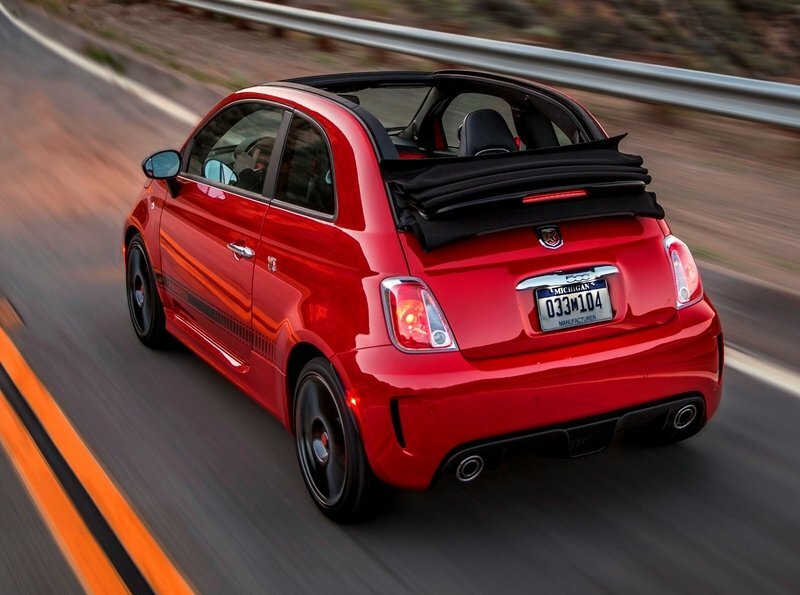 The 500C cabrio was new with Abarth trim in Spring of 2013, and is expected to be the volume leader for 2014 with almost no performance or interior room downsides versus the coupe. These cute Fiat 500 twins are looking just as fresh and intimidating as always versus the hum-drum base-engine 500 models, and the rest of the econo-car hatchback market in the U.S. These are two cars for people who have chosen the ultra-nimble hot hatchback route, plus they offer up both driving thrills and the feeling of driving a classic Italian racing brand. While the regular 500 undercuts the Mini Cooper significantly on price, the $6,000 Abarth premium makes life more challenging versus the hottest Mini performance cars. Even so, the Mini’s dated styling means the trendiest shoppers have long since moved on to something more current. The 500 Abarth also undercuts the equivalent Mini Cooper S engine on price, but moves this tiny machine past $26,000 for the Abarth 500C - which is uncomfortably close to the Subaru BRZ and other performance cars. The arrival of the American-spec Ford Fiesta ST certainly complicates the theoretical comparison test for these performance supermini’s. Logic is typically not the most critical factor in this realm of the new car segment, and the 500 Abarth nails the less-concrete buying criteria like passion, brand image and performance zest. 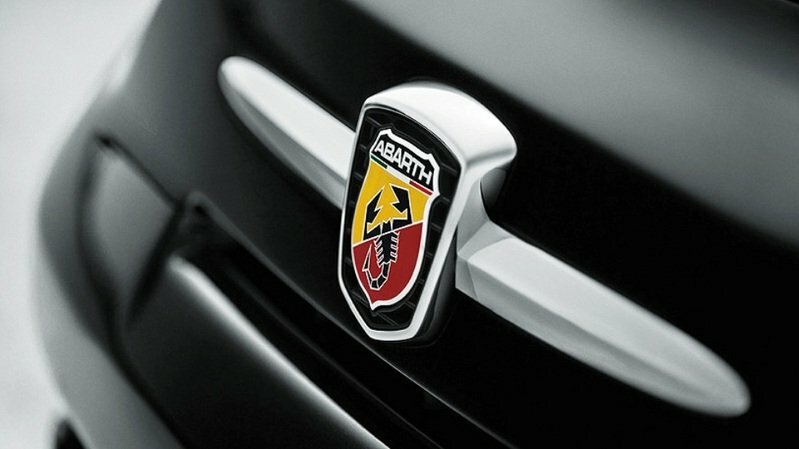 Click past the jump for the full review of the Fiat 500 Abarth and the new 500C Abarth, with all the updates on the new features and changes for 2014. Updated 11/7/2013: TopSpeed’s Phillipe Daix got his hands on a 500 Abarth this week and put together a short drive video of the peppy city car. Check out the video after the jump. The Fiat 500 Abarth took me by surprise, as I was not expecting so much improvement over the base 500. 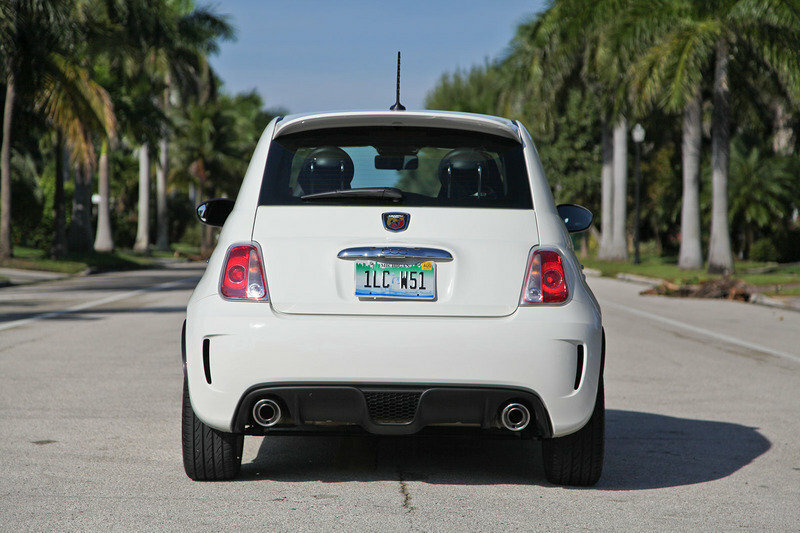 The scorpion badge has never been a cheap addition — our Abarth tester has a $30,000 MSRP — but after a week of motoring around South Florida, I still think it is a good buy. 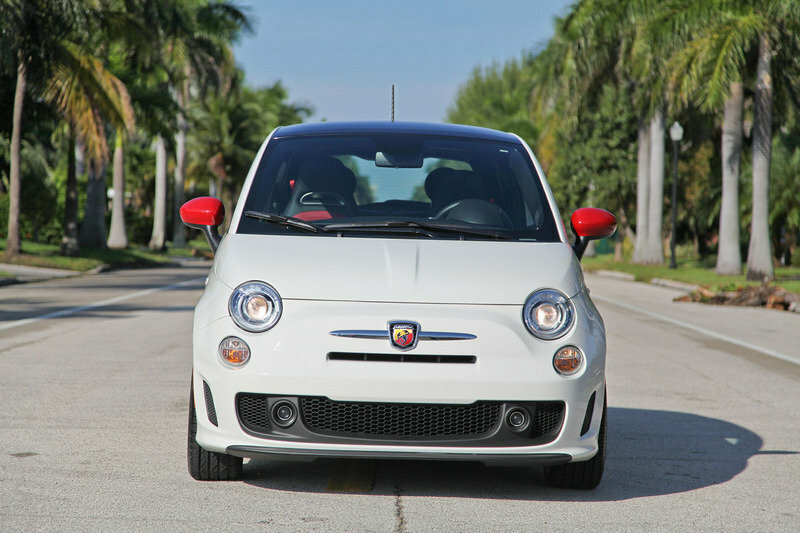 The 500 Abarth looks sharp and cute on the outside, but it really drives well. On second thought, it drives exactly how one would expect of an Abarth. Sure, it’s a bit sloppy because of the high center of gravity, but it is still very controllable and easy to toss around in the twisties. The wider tires and stiffer suspension transform the 500, allowing for impressive cornering and braking. Additionally, the exhaust note plays a huge role in making the drive more enjoyable, as it is very pronounced under load and we were greeted by some nice exhaust pops at each gear change with the sport mode activated — spot on for an Abarth. Of course, all this fun is enhanced by its turbocharged engine that delivers the perfect amount of power to maximize your fun behind the Abarth’s wheel without going overboard. As expected, turbo lag is always just a premature gear change away, but once you find that sweet spot in the power curve — around 3,000 rpm — all jerkiness goes away and the turbo is primed for spooling. The manual gearbox is very fast and precise, and it supports the engine superbly. We think of the 500 Abarth as a mini Ferrari, but one that you can actually afford to buy and enjoy driving through the city. 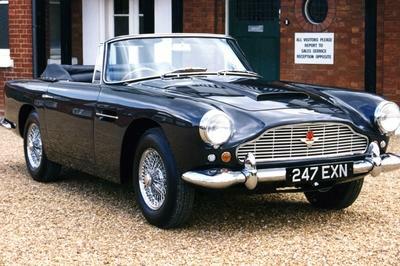 This car is the perfect illustration of the old saying "it’s better drive a slow car fast, than a fast car slow". The style of these two little racing compacts is still very nice to take in, with their upright profile and blocky shape in delightful contrast to the lowered suspensions, red brake calipers and performance body kit detailing. The 500 is an unlikely hero for the styling and re-launch of the Fiat brand in the American market, but one that has been carefully marketed and focus-grouped to make sure it has all the retro chic of the reborn Mini Coopers. As big as the original 500 was for Fiat in Europe, it was quite the odd duck on American soil even during its 1950s and 1960s heyday. This was a car that was dwarfed by even the original Mini, making it barely more than a closed-top scooter in most American eyes. 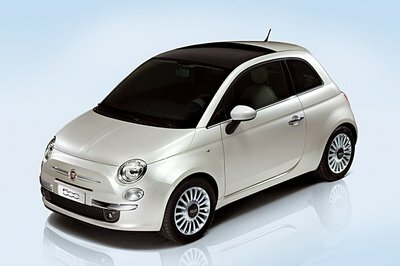 Therefore, the success of the Fiat 500 with American buyers who know nothing of the model’s original style or heritage is impressive. 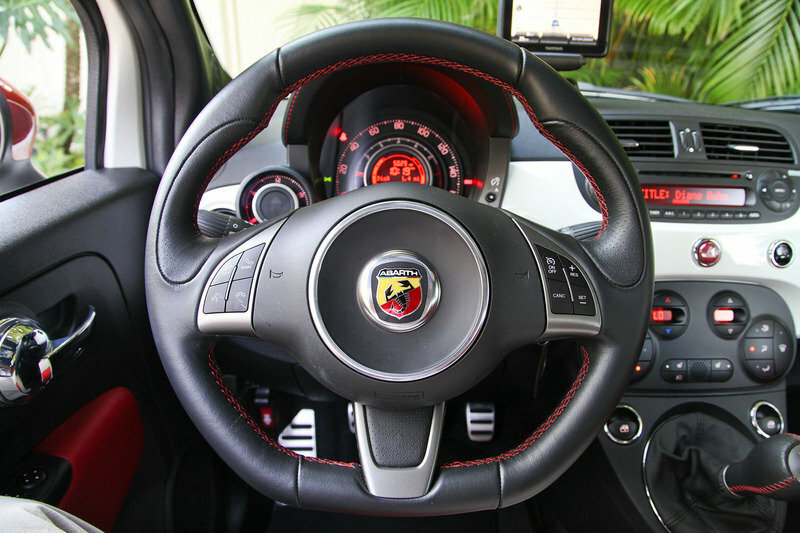 The 500 Abarth makes the leap to being stylish by leveraging the luxury position of Italian cars, clothing and jewelry, citing its Italian style at every opportunity. The 500C Abarth looks like the model to choose simply based on exterior styling. The power-operated soft-top is available in multiple colors, and can be opened or closed even when the Fiat is moving up to 50 mph. 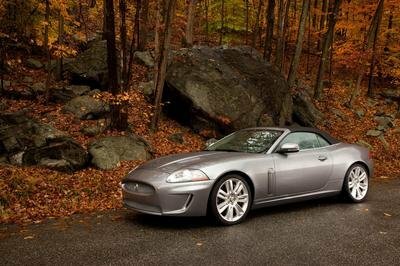 The soft-top maintains the coupe’s floding back seat, luggage capacity and seating room exactly - but the open roof design makes it much more fun in summertime and for backseat passengers. Personalization is the name of the game in small car profitability, and the 500 Abarth obliges with numerous styling options, like contrast-color mirror caps and body-side striping. The Abarth trim is already loaded to the gills with extras to differentiate it from basic 500 models, and the dark trims and cool colors make the Abarth the most masculine 500’s available, by far. The 500 Abarth and 500C Abarth are updated inside with a new passenger-seat mounting point that is a full inch lower than last year. The passenger seat now offers a central armrest as well - matching the comfort, adjust-ability and headroom of the driver’s seat. Italian luxury goods and Ferrari-like embellishments wrap the interior in custom-stitched leather and high-back bucket seats. These seats are a godsend versus the original 500 units, which have a short base and little lateral support to keep you in place during fast corners. The Fiat 500 has a much higher seating position than the Mini Cooper, which is both good an bad. It makes ingress/egress and visibility much easier, but also creates some big body sway that requires firm seats. 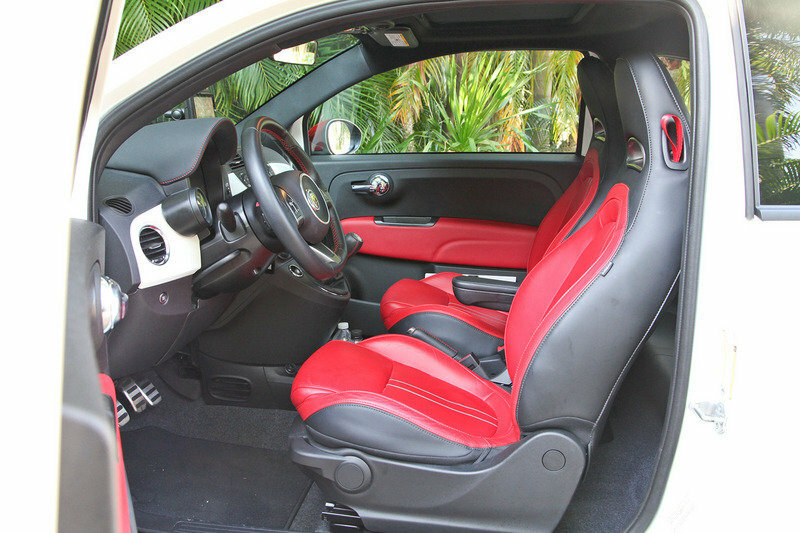 A longer base and optional leather colors are the final treats for the Abarth performance seats. The ride inside the Abarth is much choppier than standard 500 Fiat models, but the 500C brings slightly more relaxed spring and damper settings. 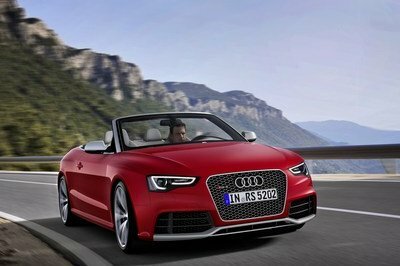 Little structural rigidity or weight gain on the cabrio is a big achievement, helped by maintaining the roof pillars for crash strength. The 500 line is missing all of the latest Chrysler UConnect touchscreen technology, instead making do with a removable TomTom navigation unit. The audio systems make up for this equipment gap, which smart Bluetooth integrations and a thumping Beats Audio upgrade. 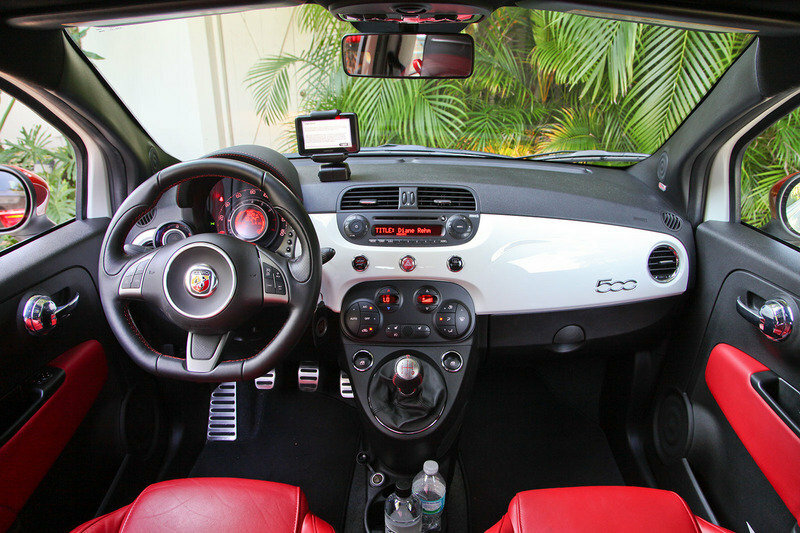 Besides the lack of a nav touchscreen, the 500 Abarth is very well equipped, with only heated seats and automatic climate control the other major options inside. 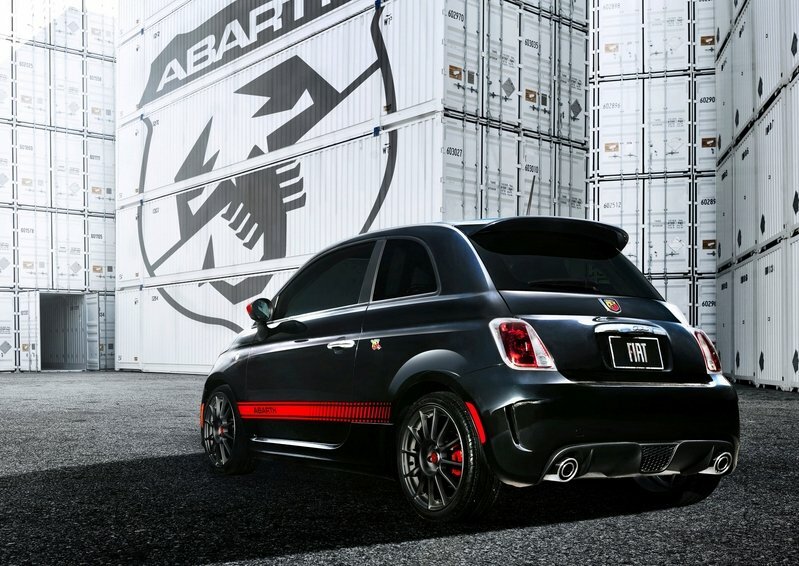 The 500 Abarth is a charming performance car with real pull and strength in its acceleration profile. The 170 pound-feet of torque from this MultiAir turbocharged engine has a very broad and flat peak, starting at just 2,500 rpm. 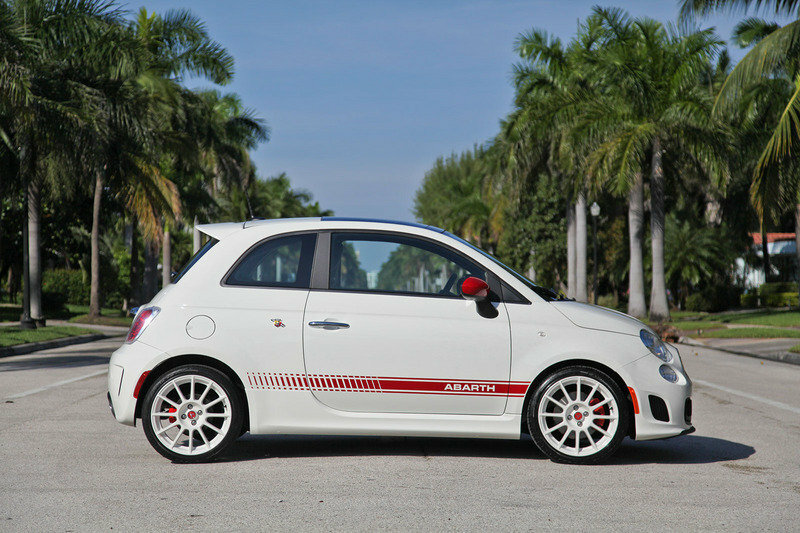 160 horsepower is plenty to motivate this tiny machine, with sprint times of about 7 seconds by Fiat’s official tally. This is more than four seconds quicker than the base-engine 500 models. The top speed for the Abarth models is also up significantly to a quoted 129 mph. The engine is a snappy revver and also has a very pronounced and unique sound profile from the Abarth-tuned dual exhaust pipes out back. A five-speed manual transmission is the only option, which is a blessing when driving hard but not as nice on the highway. The little Fiat would be calmer and quieter at 85 mph if this box had a taller sixth cog. Dual-valve Frequency Selective Damping (FSD) KONI front shock absorbers deliver maximum grip. 40 percent stiffer spring rate and 0.6-inch (15mm) lower ride height mean improved handling and minimal body roll. Increase in negative camber to -1.5 degrees delivers improved grip and steering precision. Reinforced twist-beam rear axle with strengthened coil-spring supports. 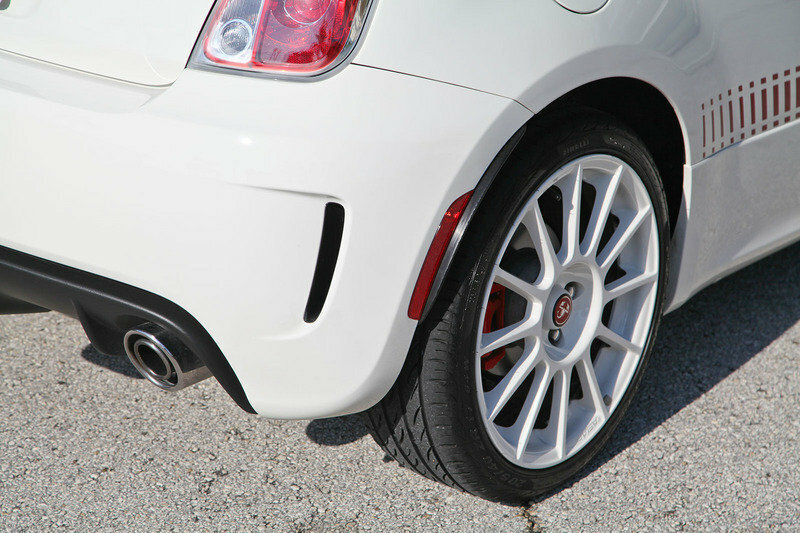 Abarth-specific rear-stabilizer bar increases cornering grip. 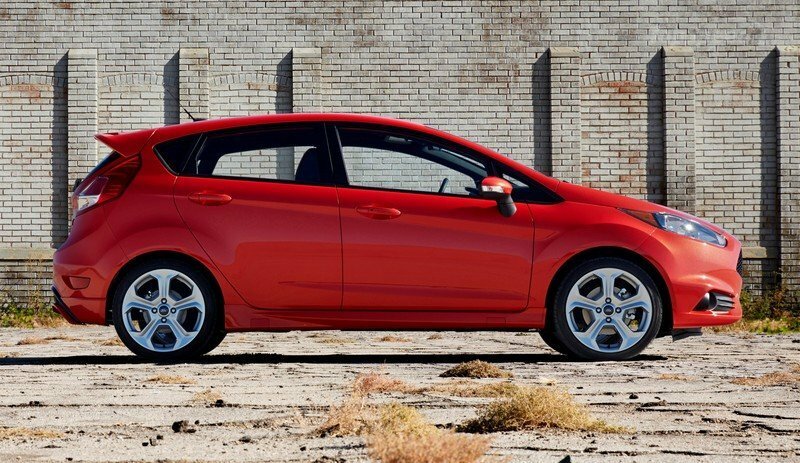 20-percent stiffer rear-springs and 0.6-inch (15mm) lower ride height mean improved handling. 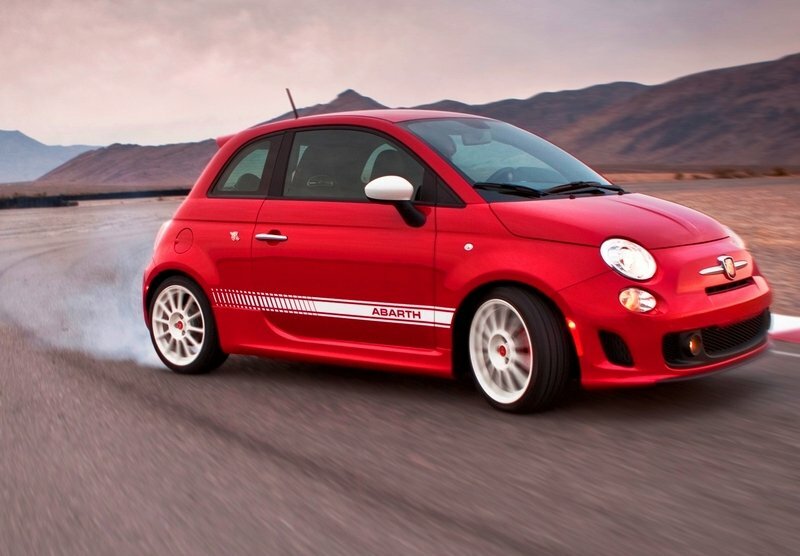 The Fiat 500 and its performance Abarth trims are all 2013 Top Safety Picks from IIHS. This is a great score for such a small car, and is evidence of the heavy investment Fiat undertook to modify its European 500 model for American crash safety. This latest score marks a significant improvement over the first few attempts by the 500, which initially earned only a "Good" score - but was strengthened again by Chrysler’s crash experts. Fiat has not yet announced the 2014 pricing for the Abarth twins, but an increase of about $400 is likely to match inflation. 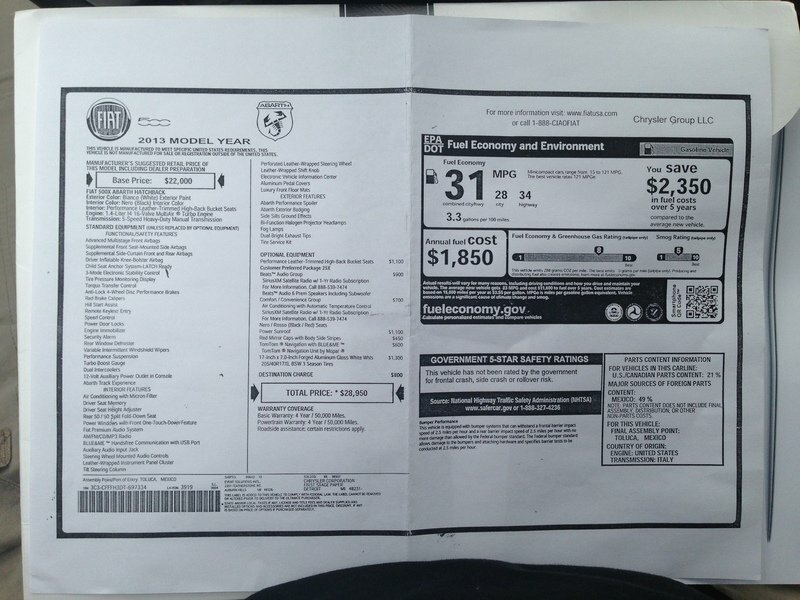 The 2013 base prices were $22,000 for the coupe and $26,000 for the 500C Abarth cabrio. The Fiesta ST is a five-door hatchback versus the 500 Abarth’s two doors, but it is also quite compact versus typical American cars. Performance claims for the Fiesta ST’s sprint pace is a few tenths of a second quicker for the Fiesta ST, which is also offered only with a manual transmission. Despite the next Mini being very close to its official reveal, the Convertible version will carry on with the current body shape for the next year or more. The Cooper Cabrio is a full drop-top, which adds appeal versus the targa-style roof of the 500C. The Mini Cabrio is much slower than the 500C Abarth until upgraded to its Cooper S trim, which starts at $28,000 before options. 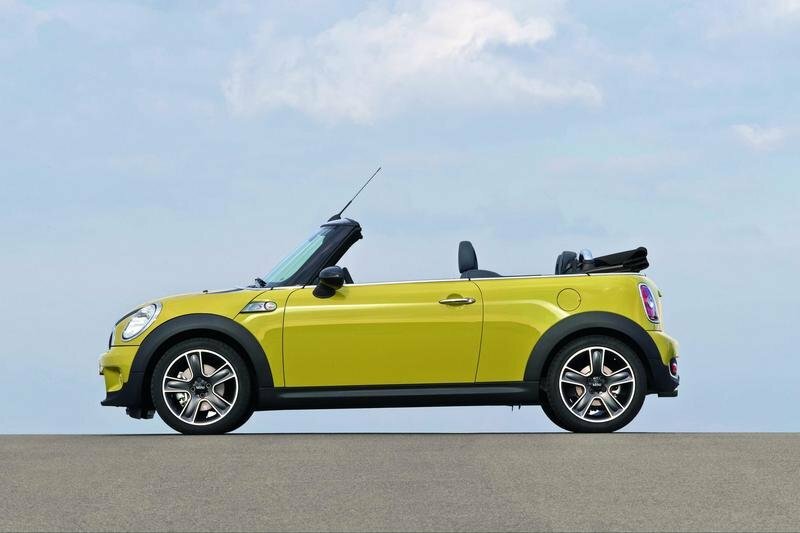 The Cooper S Cabrio can be optioned to include a six-speed automatic transmission, while only the non-Abarth 500 models are available with an automatic. Giant Abarth engine power and performance suspension mean this 500 Abarth offers grown-up levels of driving fun. The included track day and Abarth heritage are just extra bonuses versus the pricey Mini Cooper GP trims, as is the versatile folding ragtop of the 500C. 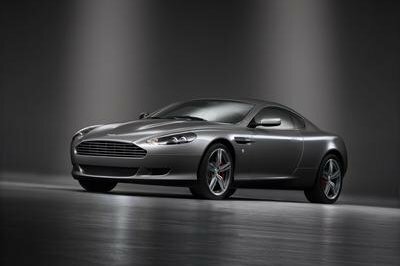 Among buyers who crave Italian style and luxury features, there is no better option to combine Ferrari-like thrills with an urban run-about. The 500 Abarth will be much easier to hand-brake turn into a street parking spot than the Ferrari anyway. September 1, 2013 , Auburn Hills, Mich. - The Fiat 500 Abarth brought world-class performance and precision, purposeful and aggressive styling, high power-to-weight ratio and limited-production volume to the small-car segment in North America. Adding even more excitement to the “small but wicked” lineup, in 2013 the Fiat 500 Abarth Cabrio (500c) arrived, harking back to the open-air track cars of the 1960s. 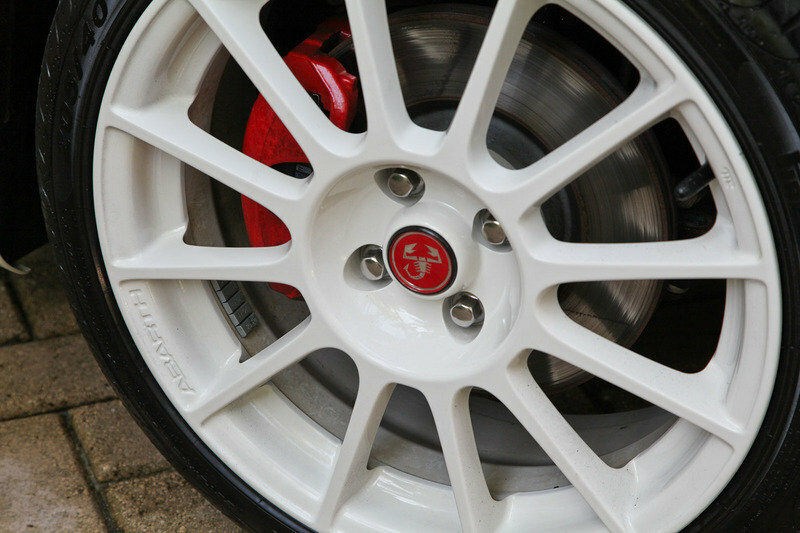 The Abarth models provide one of the most visceral driving experiences in the industry, inspired by the racing traditions that made Abarth a success on international racetracks. With the Fiat 500 Abarth’s high-performance DNA intact, the 2014 Fiat 500c Abarth is engineered with the same track-proven attributes that have made the hatchback model a success on European and North American roadways and racetracks, but now brings even more fresh air and the unmistakable Abarth-tuned exhaust note into the cabin. 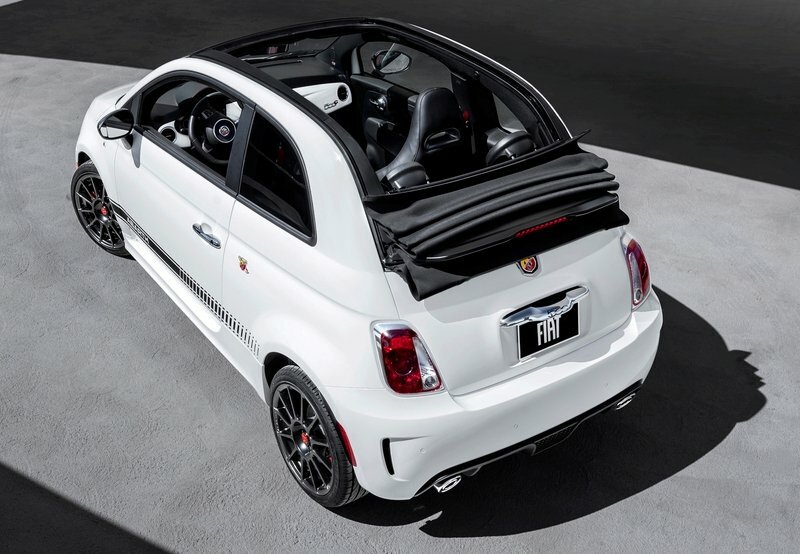 With just the push of a button, the Fiat 500c Abarth’s power-operated cloth top retracts up to the rear spoiler during speeds up to a best-in-class 60 mph (a midway point can be chosen by pressing the button anytime in between). Press the roof button again, and the roof will fold all the way open and tuck neatly behind the rear head restraints (up to 50 mph). In addition to its cleverly designed multi-position power-retractable cloth top, the Fiat 500c Abarth’s fully stamped bodyside silhouette retains the iconic Cinquecento form while delivering added structural strength. In addition, its longer windshield and minimized header design maximize rear-seated passengers’ outward visibility while minimizing cabin turbulence. In the late 1950s, Karl Abarth believed that race cars with brilliant performance could be derived from small, lightweight, everyday driving cars — including the original Cinquecento (500). And his tradition of track-ready small cars continues today with the high-performance Fiat 500 Abarth and Abarth Cabrio. The 2014 Fiat 500 Abarth and Abarth Cabrio feature the track-proven 1.4-liter MultiAir Turbo engine for 160 horsepower, up to 170 ft.-lb. of torque and 0-to-60 mph performance in the low 7 second range. 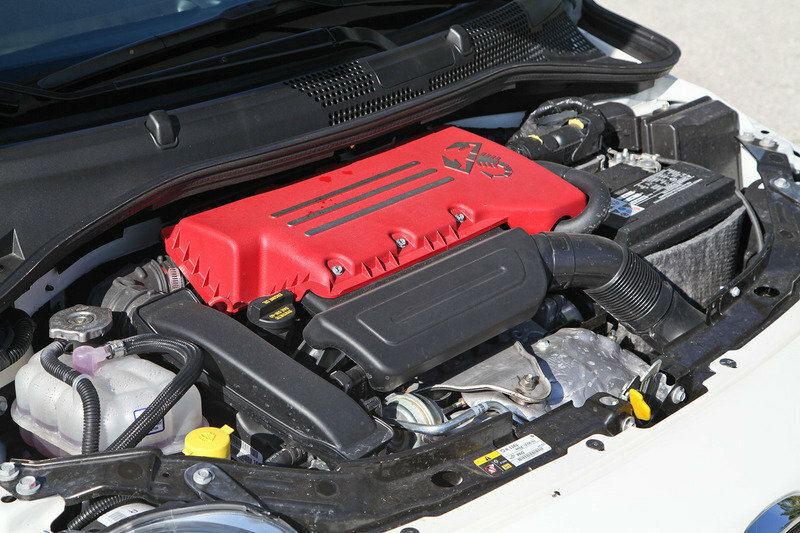 Compared with the naturally aspirated 1.4-liter MultiAir engine, the boost to 160 horsepower on the Fiat 500 Abarth and Abarth Cabrio is largely due to its single turbocharger that operates off engine exhaust and utilizes energy that would normally be wasted through the tailpipe. The turbocharger spins up to 230,000 rpm to convert exhaust heat and pressure to a rotational force that drives a compressor. The compressor draws cool air and pumps it into the intake manifold at increased pressure (maximum 18 psi / 1.24 bar) that results in a greater amount of air in the cylinder and, hence, more power.